Decking has increased in popularity in recent years, many of us spending the entire weekend or longer digging up concrete slaps and patios, replacing them with wooden decking or constructing raised timber decks over parts of garden or surrounding ponds and areas that typically didn’t get used. Garden decking gives you much more flexibility than patio blocks, and when custom built it doesn’t only look great but offers an expansion of your garden for entertaining, dining or relaxing in the sun, it also adds value if maintained. With the first day of summer only a week or so ago and hopefully many hot and sunny days to come, if you haven’t been working in your garden already then no doubt you will be soon, unlocking the back door handles and venturing out. A great place to start after you’ve got on top of mowing the lawn and planting your borders is cleaning and preparing your decking for the summer days and evenings ahead. Larch and cedar woods are commonly used in the construction of timber decking due to their suitability for outside use with high resistance to all weather conditions and lasting durability. However if left uncared for over the years or if refinishing is needed they can start to appear dirty and worn. 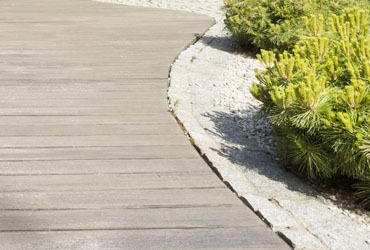 This article details how to look after your garden decking, including some great tips on how to preserve its finish ensuring it lasts for years to come. Brushing away debris from your decking regularly throughout the year will help preserve its life. Sweeping away bits of moss and fallen leaves will stop mould and green algae forming, leading to not only slippy surfaces but slowly rotting the wood. Use a high pressure washer or if you haven’t got one then warm water with a multipurpose cleaner and garden brush to remove any moss and algae while cleaning in between the grooves of the decking. If you’d rather use a homemade natural based cleaner then read our article on how to clean wooden garden furniture, which lists some ingredients found in most kitchen cupboards. If it’s been a couple of years or longer since the last time you stained or applied wood preserve to your decking then there’s a good chance it will be ready to be refinished. A simple check can be done to see how resistant your timber decking is and whether or not it needs restaining. Sprinkle water on a small area of the decking and see if it is absorbed into the timber quickly or beads up like water on a waxed car, and if the water soaks in quickly then it’s time to grab a can or two of preservative stain and your paint brush. If you’ve decided to apply a new coat of wood stain or preservative then you’ll need to clean the decking, as in step two, while also sand it down to ensure it’s free from any loose dirt, marks and flaking stain. Use a flat belt power sander and/or orbital floor sander to sand down the entire surface. After having completed the sanding, including the handrails then use a soft brush to sweep away the sanding dust and then either rinse the whole area using a hose or damp towel. When purchasing a stain, then it’s best to use one that will soak into the wood rather than a simply a preserve coating. You may have to apply several coatings due to it absorbing into the timber but the end result will be longer lasting and minimise the chance of peeling and flaking. It’s also good to choose a stain that dries with a clear or opaque finish rather than a dark coloured stain that within a few month’s starts to show wear and faded patches. Frequently sweeping and cleaning your garden decking, along with checking whether it needs restaining once a year will ensure it keeps its attraction and provide many more years of fun.